Get ready to mark this off your bucket-list! Experience Churchill Downs Racetrack, the most well-known racing venue in the world. 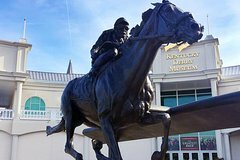 The Kentucky Derby Museum includes daily historic walking tours, two levels of family-friendly interactive permanent & temporary exhibits, “The Greatest Race,” a 360-degree immersive sound and visual experience that’ll get your heart racing and emotions soaring, and a chance to meet the Museum's resident Thoroughbred and miniature horse. You will also have access to the Finish Line Gift Shop, Kentucky fare in the Derby Cafe, and much more! Located in Louisville, the Kentucky Derby is one of America’s most exciting horse racing events in the world and takes place at Churchill Downs Racetrack. It is the first leg of the American Triple Crown and is known as "The Most Exciting Two Minutes In Sports" because of the actual duration of the race. Some like to call the race "The Run for the Roses" for the blanket of roses draped over the Derby winner. When you visit, you will enjoy a self-guided tour of the Kentucky Derby Museum, which includes two levels of family-friendly interactive permanent & temporary exhibits. Ten minutes past each hour, you will have the opportunity to see "The Greatest Race," an 18-minute movie about the Kentucky Derby and its history, a story that puts you right in the heart of the first Saturday of May. Immediately following "The Greatest Race" and at 30-minutes past every hour, you will experience an exhilarating 30-minute guided walking tour of historic Churchill Downs Racetrack and witness where some of the most famous teams of jockeys and Thoroughbreds competed such as Secretariat, Barbaro, Big Brown, California Chrome and the most recent Triple Crown winner in 2015- American Pharoah.